Another quarter has come and gone. We’re bracing ourselves for the coming winter. It’s also time for a check-up on my Lending Club account, and the returns I’ve gotten. In my 2Q13 update , my account was showing a return of 14.08%. Keep reading to find out if I’ve managed to maintain that rate. One of the other things that I wrote about in last quarters update was that my portfolio finally suffered it’s first defaulted loan. In this quarter, I had a few loans that went into the late categories, but ended up coming back to normal. I’m still a little surprised that I haven’t had more defaults. I’m glad that I’ve been lucky enough to only have the one default since January, 2010. The closer you get to true passive income, the less work you have to put into it. Lending Club portfolios are not true passive income. I’ve discussed it before, and it bears reiteration. They are awful close though. In all, I spend about 20 minutes a month to reinvest the payments and interest that have come in. It’s not all at once, usually. With the $9-$10 in interest that my portfolio is earning each month, that’s a pretty good wage. Maybe it’s an active passive income stream. Oxymoron for the win! Now, for what everyone has been waiting for. (Or scrolled down really quickly for) Without any further defaults, and staying on top of reinvesting the funds as they come in, I’ve been happy this quarter with my return. 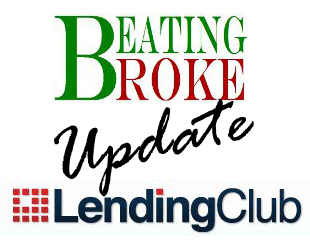 As of 10/4/13, my current Lending Club returns rate displayed is 14.69%! It’s bounced back nicely from the default. I’ve been investing the funds a little more aggressively over this quarter which helps explain some of that. At this point, my reasoning is that I’ve been investing with Lending Club since 2010 and have only had one default. The risk is still there, I think, but I don’t think it’s quite as bad as some would like to make it sound. Where will my rate be at the end of the year? I’m hoping it will remain steady. I’ll be maintaining the same Lending Club investing filter, and hope that doing so will maintain the low default rate I’ve been lucky enough to have. How is your Lending Club portfolio doing?